Busch Gardens senior veterinarian technician Mary Port works with senior veterinarian Dr. Pete Black to prepare a greater anteater for a cardiology exam at the Animal Care Center. The Center’s treatment room offers park guests views of the park’s veterinary staff conducting preventative checkups, treatments and surgeries through floor-to ceiling glass walls. Busch Gardens welcomes guests to closely observe and even take part in the animal care experience when the Tampa park opens its new Animal Care Center on Jan. 23, 2012. From nutrition to treatments, X-rays to surgeries, much of Busch Gardens’ animal care will be conducted in guest view in this new state-of-the-art facility. The major guest components of the new facility include a nutrition center, treatment rooms, a clinical lab and an interactive diagnostic activity. The nutrition center will feature a kitchen similar in set-up to a cooking show on television. Educators will lead demonstrations several times a day on the planning and preparation of animal diets. Guests will even have the chance to assist in preparing and doling out the range of food the park provides its animals, from fruits and vegetables to crickets and mealworms. Nutrition demonstrations will take place during scheduled times each day. The treatment center will allow guests to watch as Busch Gardens’ skilled vets do preventative checkups, treatments and surgeries on animals. Guests will be able to see into the rooms through glass walls, and audio capabilities will allow guests to talk to vets working behind the glass. Cameras placed over the exam table will show unique vantage points to guests who can watch on monitors. During treatments and surgeries, zoo educators will also be on hand to talk about what’s taking place. Since it is a working center, procedures will vary daily, and will not take place during all scheduled park hours due to field work, office work and other projects requiring the vets’ time and attention. Daily schedules will be subject to change. In the clinical lab, staff will perform tests on samples collected from the animals, such as blood, urine, and feces, using the same types of laboratory equipment used in human hospitals and veterinary clinics. A camera connected to the laboratory’s microscope will allow guests to see exactly what the staff who are looking under the microscope see. Guests can also participate in a diagnostic exercise by scanning an interactive activity card at several stations as they follow an animal from diagnosis to treatment to blood and lab work to a final outcome. In addition to the guest views, the new facility will also include animal recovery and holding rooms and vet offices. The new, nearly 16,000 square-foot facility replaced the rhino exhibit in the Nairobi area of the park. The park’s former animal care center was located behind the scenes. Busch Gardens, and its parent company, SeaWorld Parks & Entertainment, are world leaders in animal care, caring for more than 60,000 animals, one of the world’s largest zoological collections. Busch Gardens Tampa cares for more than 2,000 animals representing 307 species. Busch Gardens Senior Veterinarian Dr. Pete Black consults with Dr. Cathy Lynch-Buckhorn, Associate Vice President for Women’s Health and Professor of Obstetrics and Gynecology at University of South Florida’s Morsani College of Medicine, while performing an ultrasound on a white-cheeked gibbon at the Animal Care Center. From nutrition to treatments, X-rays to surgeries, much of Busch Gardens’ animal care is conducted in guest view in this new state-of-the-art facility. 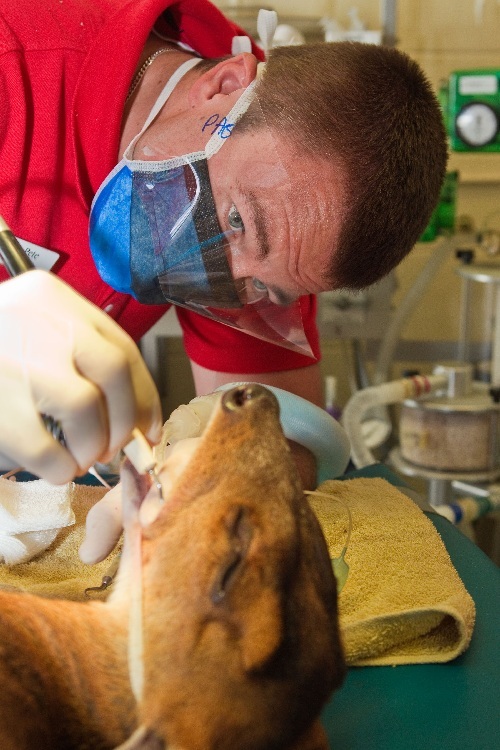 Dr. Pete Black performs an annual teeth cleaning on a muntjac at Busch Gardens’ Animal Care Center. 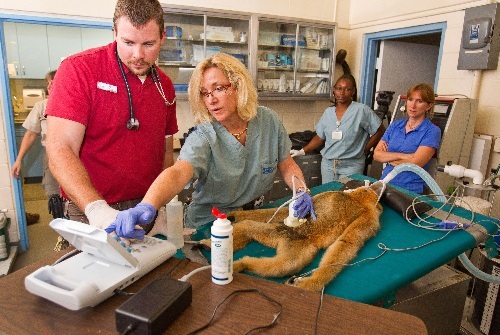 From nutrition to treatments, X-rays to surgeries, much of Busch Gardens’ animal care is conducted in guest view in this new state-of-the-art facility. 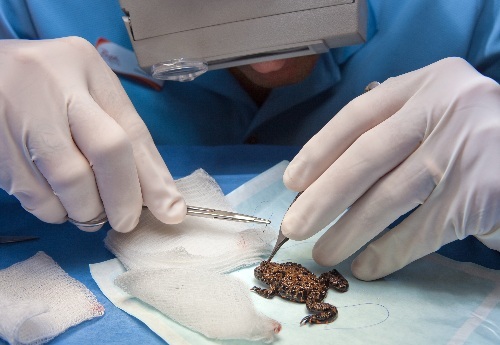 Senior Veterinarian Dr. Alex Cole carefully sutures a fire-belly toad’s ulcerated eye in the treatment room at Busch Gardens’ new Animal Care Center. The Center’s treatment room offers park guests views of the park’s veterinary staff conducting preventative checkups, treatments and surgeries through floor-to ceiling glass walls.